VietNamNet Bridge – A group of scientists from Industrial University of Ho Chi Minh City have manufactured an automatic water hyacinth cutting machine that they hope will help in clearing 700 kilometers of canals in Ho Chi Minh City that are now clogged with the weed. A water hyacinth cutting machine being tested in U Minh Ha National Park in the Mekong Delta province of Ca Mau. The City spends tens of billions of dongs to remove water hyacinth from canals and rivers each year. However they are facing a losing battle with growth being faster than clearance. Nguyen Van Dam, director of the HCMC Irrigation Works Management Company, said that environmental workers have mainly used ropes to section off water hyacinth clusters into small parts and then attempt to pull them ashore to transport to garbage dumps. This method is slow and very hard on workers. The immensely thick water hyacinth growth has blocked the flow of water and stagnation has provided a breeding ground for mosquitoes in Binh Thanh, Cu Chi, Binh Chanh and Hoc Mon districts. This only worsens during the rainy season. The City People’s Committee has instructed the Department of Science and Technology to survey canals in Binh Thanh District so as to test out this new machine from July. The automatic water hyacinth cutting machine was created by a group of scientists from the Industrial University of HCMC in 2010. Dr. Bui Trung Thanh, head of the group, said that the machine has specially designed wheels that can move across water hyacinth clusters without getting stuck. A sharp blade in front helps cut the water hyacinth weeds into bits which can then be moved ashore via a conveyer belt. The machine operates with a hydraulic system. The HCMC Irrigation Work Management Company has used the machine on a trial basis to clear some canals in Binh Chanh and Hoc Mon District since 2011. It can remove 0.2-0.4 hectares of water hyacinth per hour. Phan Minh Tan, Director of the Department of Science and Technology, said that HCMC has 170 canals and about 700 kilometers is covered with water hyacinth and other weeds. Environmental workers collect about four tons of water hyacinth a day along main canals in the City like Nhieu Loc-Thi Nghe, Tau Hu-Ben Nghe, Doi and Te. The volume is ten tons from Tan Hoa-Lo Gom Canal alone. 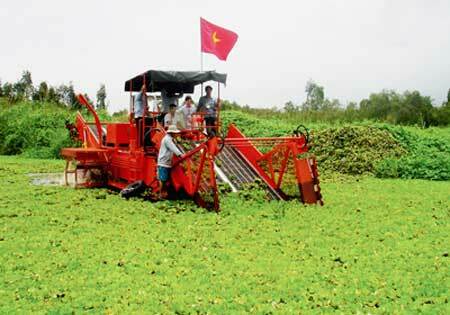 If the water hyacinth cutting machine proves successful in HCMC, it will be widely used in the Mekong Delta, where there is an entangled web of weeds in the canal system.